A bedraggled CDC director urges Americans to beware of dangerous microorganisms lurking on every conceivable surface. 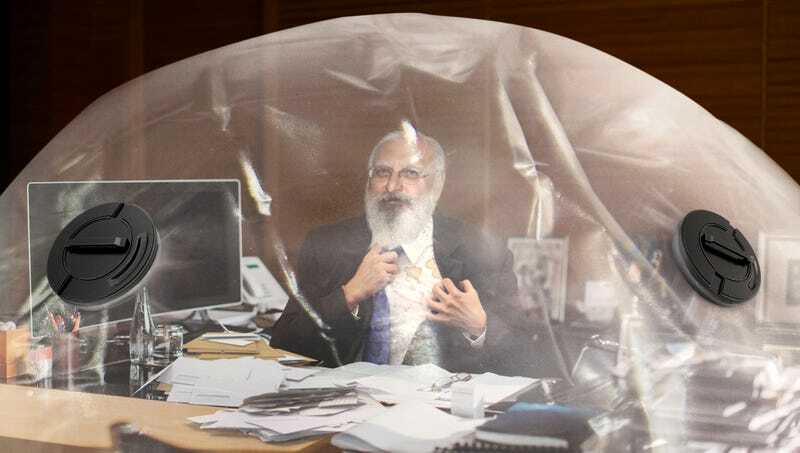 Redfield, who sported a long, unkempt beard and wore a filthy suit as he held a press conference within a hermetically sealed office at the CDC headquarters, urged Americans to avoid all areas to which the virulent and highly contagious microbes are likely to have spread, including schools, offices, shopping centers, restaurants, places of worship, the entirety of the outdoors, and even one’s own home. Redfield, who vigorously scratched at his arm, continuing until he began to tear off bloody patches of skin, pointed to a wall lined floor to ceiling with glass bottles he had filled with his own urine so it could be analyzed for possible contagions. He also suggested that every man, woman, and child in the United States do the same thing. The CDC director, who apologized to reporters for not making eye contact as he spoke but said that’s how the germs get into your mind and start controlling your thoughts, interrupted the press conference at one point to accept a written briefing from an aide. Redfield instructed his subordinate to place the document in a ziplock bag, slide it under the door, knock three times, count to 15, and then walk away. He reportedly asked the aide to stop and restart the entire process several times before he was convinced the procedure had been completed correctly. Redfield announced the CDC has already earmarked $22.3 million toward fighting the epidemic, much of which will be spent on building sealed plastic chambers and destroying every flying insect, radio tower, and dirty spoon on U.S. soil. In addition, he has reportedly directed his agency to set up thousands of emergency sanitizing stations where individuals who have been exposed can douse their faces in bleach and attempt to burn the germs off their skin with a gas stove.